During the Genius exam, the X-ray arm sweeps in a slight arc over the breast, taking multiple breast images in just seconds. Your doctor is then able to view your breast tissue in one-millimeter layers. Instead of viewing all the complexities of your breast tissue in one flat image, the doctor can examine the tissue one page or “slice” at a time. 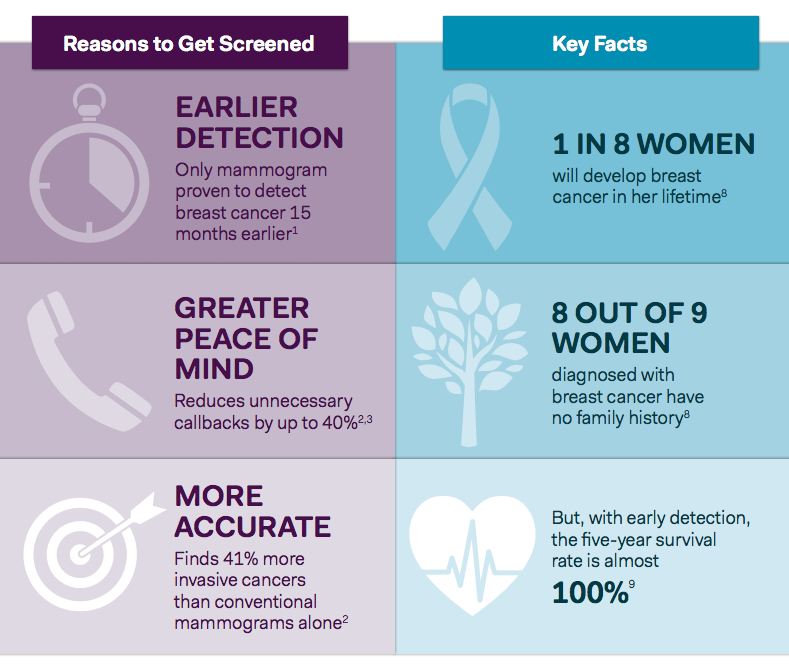 A screening mammogram is your annual mammogram that is done every year. Sometimes, the radiologist may ask you to come back for follow-up images, called a diagnostic mammogram, to rule out an unclear area in the breast, or if there is a breast complaint that needs to be evaluated. Please call to schedule your annual Genius exam. Who can have a Genius 3D MAMMOGRAPHY exam? Why choose a Genius 3D MAMMOGRAPHY exam? A Genius exam detects 41% more invasive breast cancers and reduces false positives by up to 40%. This means one simple thing: more accuracy. The Genius exam is the first and only clinically superior breast tomosynthesis exam as approved by the FDA.The Genius exam allows doctors to see masses and distortions associated with cancers significantly more clearly than conventional 2D mammography. Instead of viewing all of the complexities of your breast tissue in a flat image, as with conventional 2D mammography, fine details are more visible and no longer hidden by the tissue above or below. Very low x-ray energy is used during the exam, just about the same as a film-screen mammogram. The total patient dose of a Genius exam is within the FDA safety standards for mammography.